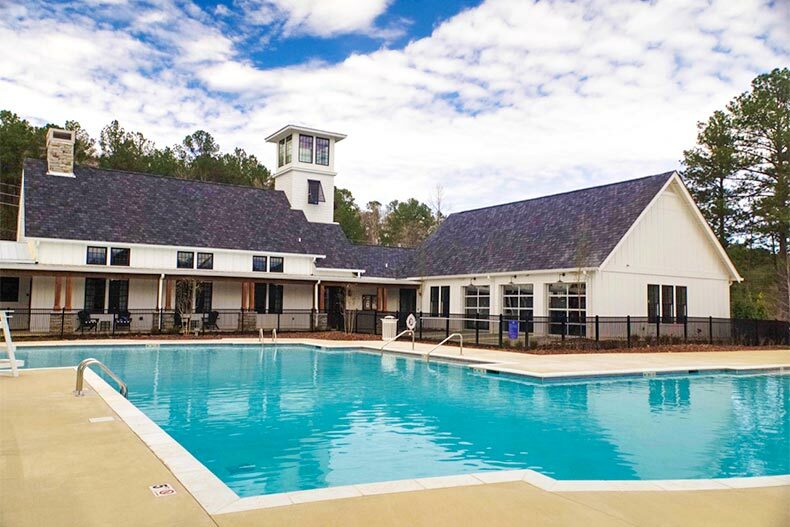 Soon to be Hoover, Alabama’s first active adult community, Abingdon at Lake Wilborn will introduce age-restricted living to the popular area. Active adults hoping to enjoy an affordable retirement will be glad to know Birmingham came in at No. 11 in our list of most affordable places to retire. See why this historical place made the list here. Designed by builder Signature Homes, Abingdon at Lake Wilborn will be a community of just 100 single-family homes, granting the neighborhood a close-knit atmosphere. Residents will have access to all of the amenities that one can expect from an active adult community, including a private clubhouse, a pool, and all of the luxuries that can be found throughout the Lake Wilborn master-planned community. Each residence will begin at 1,900 square feet and will come with three bedrooms, two bathrooms, and attached two-car garages. Additional features will include the option for bonus rooms to increase living spaces. Residents can use these extra spaces for anything from an office space, a hobby room, or an additional bedroom. A homeowners’ association (HOA) will cover much of the maintenance and exterior upkeep of the community, granting residents the liberty using their free time to pursue their passions. Many of the homes will also have the benefit of bordering a central park or private wooded areas, offering calm views and easy access to greenspaces. For amenities, residents of Abingdon at Lake Wilborn can look forward to having access to a private clubhouse, a community garden, and several gathering spaces for hosting events and private gatherings. As part of the master-planned Lake Wilborn community, residents will have further resort-style amenities offered as well. This includes a 5,000 square-foot wellness center, a zero-entry swimming pool, and a 300-acre park that sits along the Cahaba River. The park has 70+ acres of hiking and biking trails, a 21-acre lake, a pickleball court, and a bike park. Further plans include a hammock lounge, a whiffle ball field, and a farmers market space. With so much to see and do, it’s no wonder that Abington at Lake Wilborn will offer an extensive catalog of activities and events for its residents to engage. The clubhouse will host a number of events throughout the year, such as social gatherings, gourmet cooking classes, dancing classes, art classes, and more. Other planned offerings will include a number of exercise classes and wine tastings. A designated lifestyle concierge will also be available to help each and every resident find the clubs and activities that are best suited towards their individual interests. With so many offerings, residents will have no problem keeping their calendars filled. Located in the city of Hoover, Alabama, Abingdon at Lake Wilborn will be in close proximity to any daily convenience that residents might need. To name just a few, the community is near Target, Walmart, Aldi, Sam’s Club, Costco, and Sprouts Farmers Market. Multiple medical providers are also close by, including Baptist Health Center and Shelby Baptist Medical Center. Golfers can find multiple courses to play on, including RTJ Golf Traill Ross Bridge, Riverchase Country Club, Oak Mountain Golf Course, and Heatherwood Hills Country Club. There are also plenty of greenspaces and parks to choose from, including Wild Flower Park, Shades Mountain Community Park, and Oak Mountain State Park, a 9,940-acre park that is home to two recreational lakes, hiking trails, and a petting zoo, perfect for when grandkids come to visit. For daytime excursions, the city of Birmingham is just a 20-minute drive. The city is the largest in Alabama and provides even more for residents to check out, including restaurants, shopping, and some of the best cultural and historical points of interest in the country. With so much to see and do both in and around the community, Abingdon at Lake Wilborn is sure to be a popular active adult community for the Hoover and Birmingham area.